GloryBee's Pacific Northwest Blackberry Blossom Honey Bear is a regional classic! The native Pacific blackberry (Rubus ursinus) can be found growing wild in dappled sunny patches and trailing throughout the woods from the Cascade Mountains to the Pacific coast. Native Americans in the Pacific Northwest commonly used the berries and plants for food and medicinal purposes. 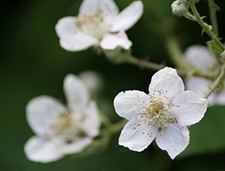 Delicate, small, pale white to lavender-pink flowers cover blackberry canes and emit a pleasant fragrance. The honey flow begins in the spring when these flowers start to bloom. Our premium Pacific Northwest Blackberry Honey is made by bees gathering nectar from this abundant source. It is a medium amber color with a rich taste and texture. This 100% pure honey is not only regionally sourced in the Pacific Northwest of the United States making it a sustainable option, but it also supports SAVE the BEE®. The convenient squeezable bear containers make them easy-to-pour. Made with BPA-free plastic, they are also reusable which reduces waste. A portion of sales from this honey is donated to honey bee research and the issue of colony collapse disorder (CCD). Certified kosher and gluten-free, GloryBee's Pacific Northwest Blossom Honey Bear is honey you can feel good about eating and sharing with your friends and family. This premium blackberry honey combines all the natural and pure flavors of blackberry in pure honey harvested in the Pacific Northwest. It has a rich, warm, confectionary sweetness and a tiny hint of spice. The rich, warm flavor is great for stepping up your baking and sauce recipes. It is also perfect for sweetening your tea, a low-calorie snack for the kids, or just a quick pick-me-up for yourself!